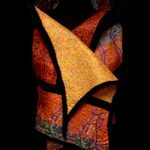 I am primarily a fiber artist residing and creating just north of Manhattan along the beautiful Hudson River. I have always loved working with my hands and my passion for wool began at an early age with knitting. 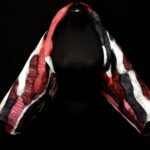 While maintaining a career in legal human resources for many years, I continued to pursue my love for creating colorful wearable art. 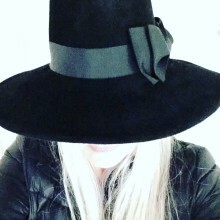 Among my creative endeavors, I pursued my certification in millinery design at the Fashion Institute of Technology in New York. Occasionally, I still create hats from pelt felts, straws, felted wool and other materials. Always seeking new creative outlets especially with wool, I began to look deeper into the wonders of this unique natural product and discovered wet felting in 2012. Felting has become my daily passion. 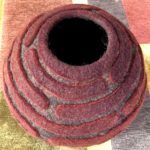 I continue to study various types of sheep’s wool and felting techniques — the results seem endless! 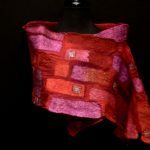 Some of my wearable felt designs requires the use of silk fabrics: habotai, organza, chiffon, crepe, margilan and recycled sari silk. Linen has also proven to blend wonderfully with wool when felted together. 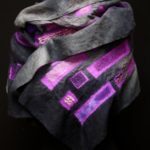 I dye many silks, as well as a variety of wool fibers in order to create uniquely colored works of wearable art and objets d’art. Every creation is individually designed and handcrafted. 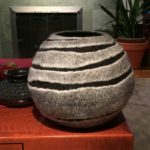 I also enjoy felted wool as a form of visual art. 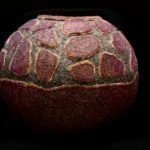 Alternating between wearable and visual work, I create wall panels and objects in the form of vessels and small sculptures. 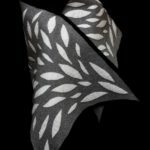 When time allows, I also experiment with natural plant dyes in the form of prints on industrial wool felt. 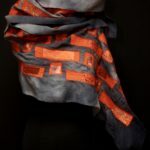 Working with wool allows me to create wearable art and objects with one of the great wonders of nature. Wool is an incredible natural product: it provides warmth and can be cooling; it can feel heavy or very light; it’s durable, resilient, fire-resistant, and versatile. Even after the often “rough” process of wet felting, wool is extremely forgiving and results in a soft and subtle product. Wool takes on the most amazing color, which is another wonderful attribute of this natural fiber.